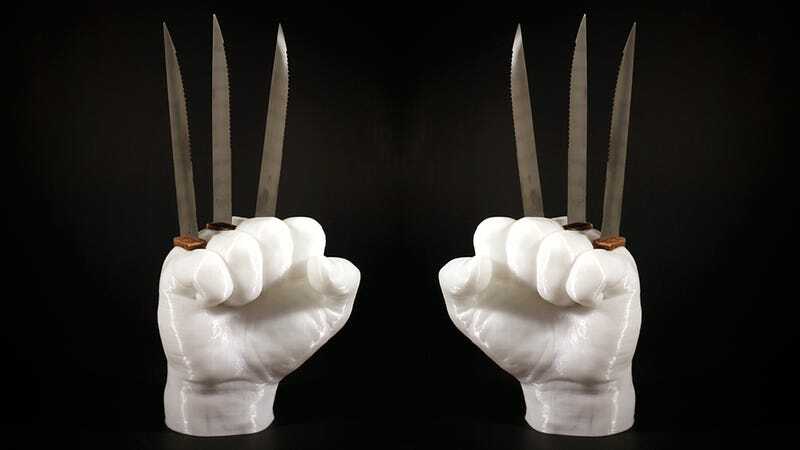 That clever Star Wars X-wing knife holder you’ve probably bought as a housewarming gift a few times doesn’t actually seem quite as clever—or injury-causing—compared to this alternative that makes it look like Wolverine’s hands are busting through your kitchen countertop. Available from ifindustries’ Etsy shop for $40 each, the individual hands are made from plastic using a 3D printer, and can hold three of your favorite steak knives, or the three that are included. It’s a fun kitchen upgrade if you’re an X-Men fan, but at the same time it’s definitely not something for households with little kids running around. The actual reason for keeping a knife block on your counter is to make your cutlery easily accessible, and to protect their sharp blades when not in use. This does neither of those things, requiring you to use a lot of care when you’re actually reaching for a knife. So maybe this is just a kitchen accessory for Wolverine fans with a really great healthcare plan.